It’s all in the entrance. The Rolling Stones have had some characteristically ostentatious ones in recent years, from taking the stage to an apt explosion of pyrotechnics on their tour behind A Bigger Bang a decade or so ago to marking their comeback shows at the O2 Arena in 2012 by having an army of drummers in gorilla suits prowl the floor, heralding the band’s arrival with their own take on ‘Sympathy for the Devil’. Nothing of the sort tonight in Manchester; a brief instrumental through the speakers, keyboardist Matt Clifford’s trademark introductory roar - 'ladies and gentlemen, The Rolling Stones!' - and Mick Jagger, Keith Richards and Ronnie Wood tear onto the stage and down the gangway to the opening strains of ‘Jumpin’ Jack Flash’. 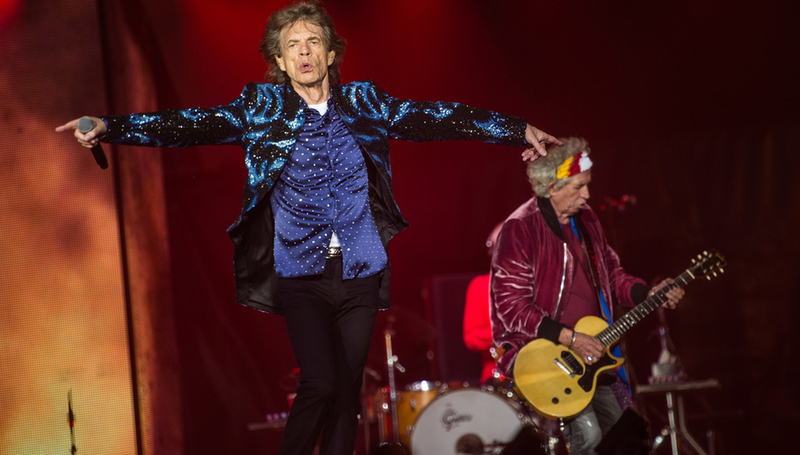 The band’s detractors argue that there hasn’t been anything especially rock and roll about the Stones for decades now. It was certainly striking that Crossfire Hurricane, the documentary released to mark their fiftieth anniversary, tracked their history only up to around the late Seventies, the implication being that anything that came after that time would either have been unflattering (Jagger and Richards spent most of the Eighties at loggerheads) or uneventful - they have existed, since the Steel Wheels tour of 1990, primarily as a live stadium band. After all, in an era of dwindling record sales, places like Old Trafford are where the money is; there’s no such thing as a cheap seat at a Stones show and yet the place is packed out. There are fans laden down with carrier bags full of merchandise everywhere you look. Like a lot of Stones gigs, there is a distinctly international flavour to the audience; Jagger name-checks Stockport, Bolton, Wigan and Liverpool, but accents from much further afield abound in the stands at the band’s first performance in Manchester since 2003; the last time they played an outdoor venue here was 28 years ago. The sense of occasion is amplified by the fact that, since emerging from a five-year hibernation in 2012, they’ve toured pretty much everywhere apart from the UK - this is the seventh straight year they’ve played live, and yet it’s taken this long to get here. Rumours of a first studio album since A Bigger Bang in 2005 have swirled that entire time, but without much solid evidence that it’s actually forthcoming; in the meantime, they’ve put out Blue & Lonesome, a collection of Chicago blues covers that represents their finest recorded work in a long while. They’ve carried on playing live in the meantime, they insist, for no other reason than the love of it. On tonight’s evidence, you have to believe them. After all, none of them need any more money at this stage, but even Charlie Watts, 77 last week and who once famously claimed that his first quarter-century with the band was 'five years of playing the drums and 20 years of sitting around waiting to play the drums', appears to be having a ball. The other three have always been much more effusive figures onstage, and Richards and Wood, who engage in what the former calls 'the ancient art of guitar weaving', alternate between frowning and grinning, at their instruments as they focus on nailing solos and at each other, respectively. It’s hard to know what’s more heartening; seeing these old pros still determined to demonstrate mastery over the songs that have made them legends, or that they still enjoy each other’s company so dearly. And then, there’s Jagger. You’d say that the man was a powerhouse, if you could be sure that he’s all man. At 74, there is something potentially superhuman about his energy, his drive, his will to remain the ultimate showman. He said recently that he thinks he covers six miles a night onstage and frankly, that sounds like a conservative estimate. He never steps moving; the catwalk that leads out into the pitch must reach close to where the halfway line would be, and yet he barely stops for breath - save for a two-song interlude on which Richards handles lead vocals. Jagger’s voice, meanwhile, remains towering, not withered by the passage of time but, if anything, enhanced. It was the superficial and less favourable things that Richards said about his old mate in his 2010 autobiography, Life, that hit the headlines but amongst the myriad compliments he paid Jagger was that, when they were starting out in tiny London clubs in the early Sixties, he could command a stage that was barely a few feet square. Any of the 50,000 at Old Trafford would snap your hand off for the chance to see the Stones in such an environment these days and yet there’s a part of you that wonders whether you’d be missing out if you didn’t get to see Jagger given spatial free reign; between his dancing, running and jumping, he’s a symphony in perpetual motion. Of course, you don’t get to be as big a crowd-pleaser as he is by refusing to play the hits, so that’s precisely what we get tonight; what surprises there are crop up early on. The seldom-aired ‘Shattered’, a sonic manifestation of the mania of New York City life in the Seventies, is featured, with Jagger firing impressively through the machine-gun-rapid verses, whilst an affectionate cover of Bob Dylan’s ‘Like a Rolling Stone’ is subject to a touch of revisionism from the frontman: 'he wrote this one for us.' Elsewhere, the obligatory Blue & Lonesome cut is a spirited take on Little Walter’s ‘Just Your Fool’, rather than the usual ‘Ride ‘Em on Down’ by Eddie Taylor. The ‘vote song’, chosen from four options across the Stones’ social media accounts, is - depressingly predictably - the most obvious one, ‘Let’s Spend the Night Together’, when we might have had their country opus ‘Sweet Virginia’ or the blues-punk catharsis of ‘Respectable’. ‘You Can’t Always Get What You Want’ heralds the start of an avalanche of big hitters. ‘Paint It, Black’ is, somehow, over 50 years old. It sounds enormous, and ominous, as ever. ‘Honky Tonk Women’ is one of a fair few Stones songs (see also: ‘Brown Sugar’) that are lyrically incompatible with the post-Weinstein world we’re living in, but that doesn’t prevent it from inspiring a full-scale singalong. ‘Midnight Rambler’ provides the set’s centrepiece; Richards once described it as containing the essence of his songwriting partnership with Jagger, saying that he considered it the one Stones song that only the pair of them could have written. Tonight, it’s less the blues opera that it’s normally referred to than a near-15-minute odyssey into not only the music that inspired the duo, but the heady tales of American lawlessness that Richards in particular once came to embody. At its close, they segue, electrifyingly and apparently spontaneously, into a snippet of ‘You Gotta Move’. The tracks that provide the true key to understanding the success of their collaboration, though, are ones that they largely wrote apart, and that are equally apocalyptic in nature. ‘Sympathy for the Devil’, mostly Jagger’s doing, has red lights flickering in the stairwells around the ground, to give off the impression of fires burning, whilst ‘Gimme Shelter’ - primarily Keith’s baby - remains timely, and is relayed with enough dramatic force to have you believing that the sky really is falling in. You think about those songs, and the cultural significance of them, and you remember that the Stones are walking history lessons unto themselves. Three of the men on this stage were at Altamont, and at Hyde Park two days after Brian Jones died. Richards’ fingers are gnarled and his voice worn but it’s still him - it’s still the guy who’s name has been a byword for hedonistic excess for so long, who is as much folk hero as rock and roll icon. These are the same guys who were busted at Redlands, who made Exile on Main St. in such decadent fashion at Nellcôte, and who were routinely forced offstage by mobs of screaming girls in their formative years. It takes Jagger bringing it up, though, to actually remember it. 'It’s great to be back in Manchester. We used to come here in the early Sixties, and we played the Odeon over and over, but I don’t think it’s there anymore - I think it’s now a parking lot,' he says. Somehow, for a band this famous and this storied, the history is second to the performance when they’re playing; you’re thinking less about what they’ve done and more about what they’re doing, partly because they remain great performers - supreme in the case of Jagger - and partly because the ageless songs are the sole focus. Even the staging tonight is modest by Stones standards, with no giant props or gimmicks. Instead, just a razor-sharp band and a clutch of the greatest rock and roll songs ever written. No wonder they still haven’t tired of playing them. The audience certainly aren’t sick of hearing them.